Fine particulate matter (PM2.5) pollution has been a major issue in many countries. Considerable studies have demonstrated that PM2.5 pollution is a regional issue, but little research has been done to investigate the regional extent of PM2.5 pollution or to define areas in which PM2.5 pollutants interact. To allow for better understanding of the regional nature and spatial patterns of PM2.5 pollution, This study proposes a novel framework for delineating regional boundaries of PM2.5 pollution. The framework consists of four steps, including a cross-correlation method, time-series clustering, generation of Voronoi polygons, and polynomial approximation with exponential kernel method. 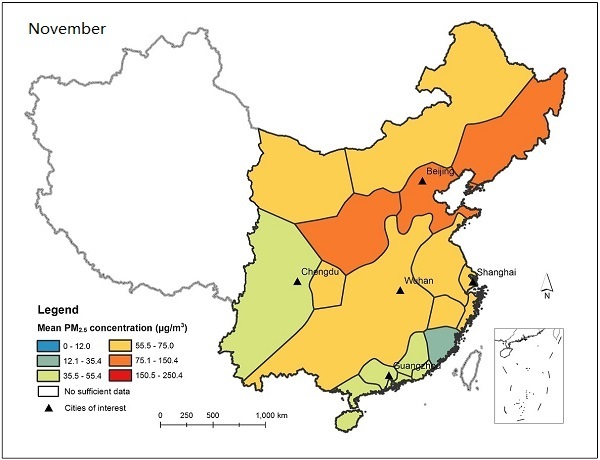 Using the framework, the regional PM2.5 boundaries for China are produced and the boundaries define areas where the monthly PM2.5 time series of any two cities show, on average, more than 50% similarity with each other. These areas demonstrate straightforwardly that PM2.5 pollution is not limited to a single city or a single province. We also found that the PM2.5 areas in China tend to be larger in cold months, but more fragmented in warm months, suggesting that, in cold months, the interactions between PM2.5 concentrations in adjacent cities are stronger than in warmer months. The proposed framework provides a tool to delineate PM2.5 boundaries and identify areas where PM2.5 pollutants interact. It can also help define air pollution management zones and assess impacts related to PM2.5 pollution, and other pollutants as well.